The power goes off in my neighbourhood for six hours, and while the guys work furiously down the road to solve what needs to be solved, I come to the discovery that I need a few more decent books. The usual thrillers are well worn and the autobiographies a bit dated, so when the power comes back, first place I head: Amazon.com - first thing I see: DC now has it's own Amazon store celebrating their 75th birthday. I mean what else can change in a few hours? Don't answer that. While it's pretty much a new coat of 'Jim Lee' paint for the DC DVD and Animation section, it's link to the Absolute collections of the publishers biggest sellers, tease of further updates, and plug for the depth of DC's history make the new store a pretty good looking chunk of recognition for DC, on one of the worlds biggest internet sites. 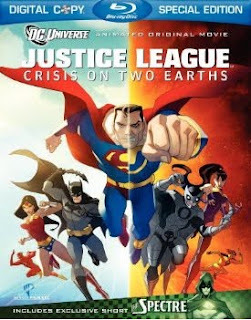 As an added bonus, the box-art for the main feature, the Justice League: Crisis on Two Earths (Amazon Exclusive with Lithograph) DVD and Blu Ray, also features the debut of the back-up animation episodes of DC's 'not so household-names'. I wonder if there's a variant with the Spectre as the main cover image, and the League as a sideliner - now thee's an alternate cover I'd pay to see!